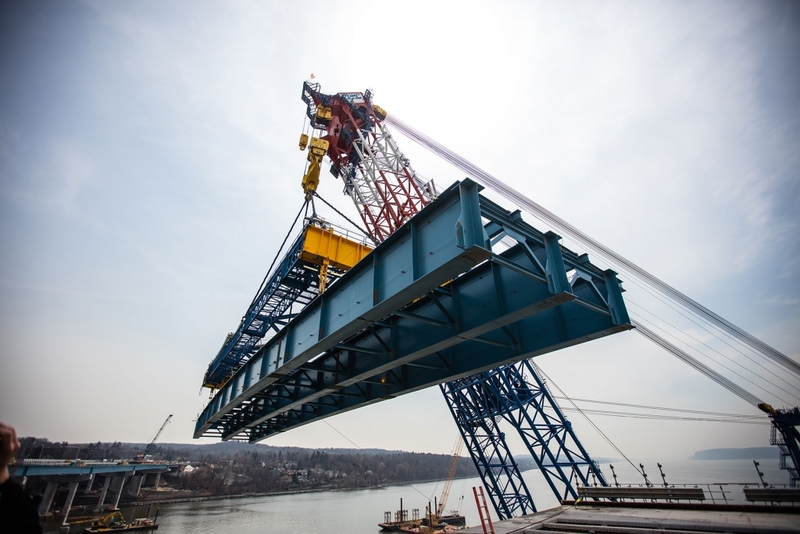 The I Lift NY super crane last Thursday installed the project’s final massive steel blue girder assembly, bringing the eastbound span of the Governor Mario M. Cuomo Bridge one step closer to completion. 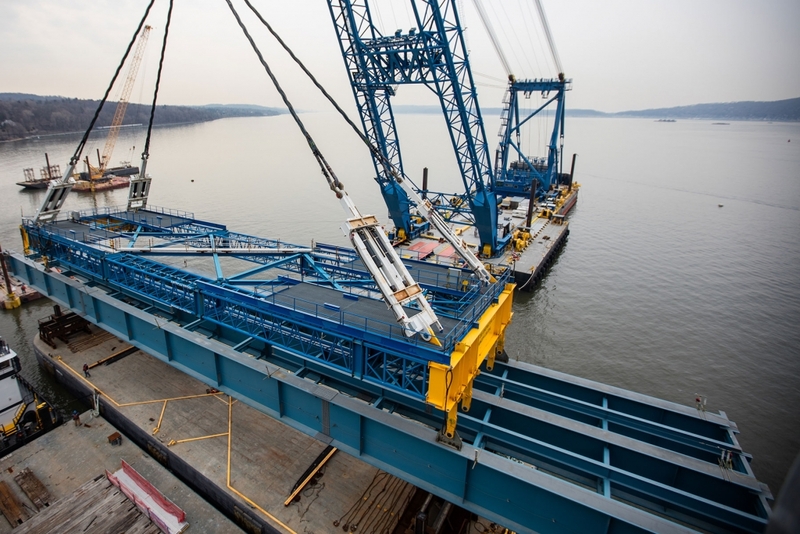 In the coming weeks, Tappan Zee Constructors (TZC) is scheduled to complete the eastbound span’s structural steel by setting a small number of individual steel girders near the Rockland shoreline. 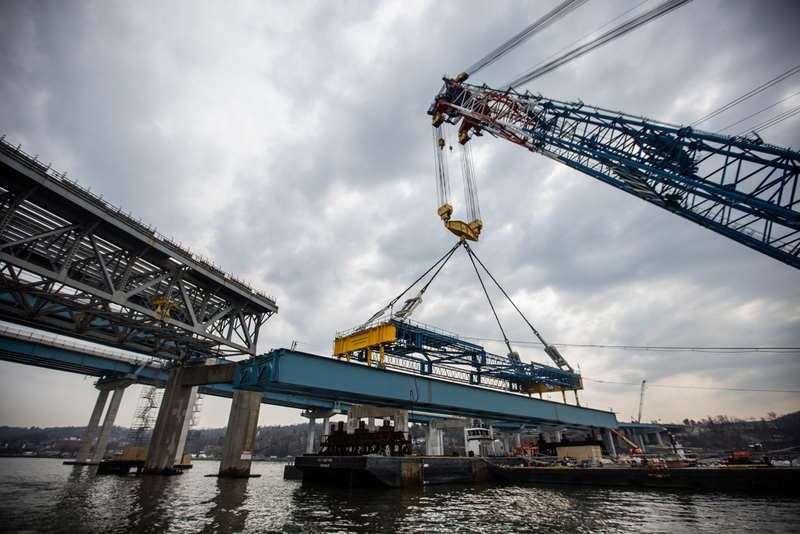 Mobile cranes will separately install these beams, connecting the span to the Rockland abutment. 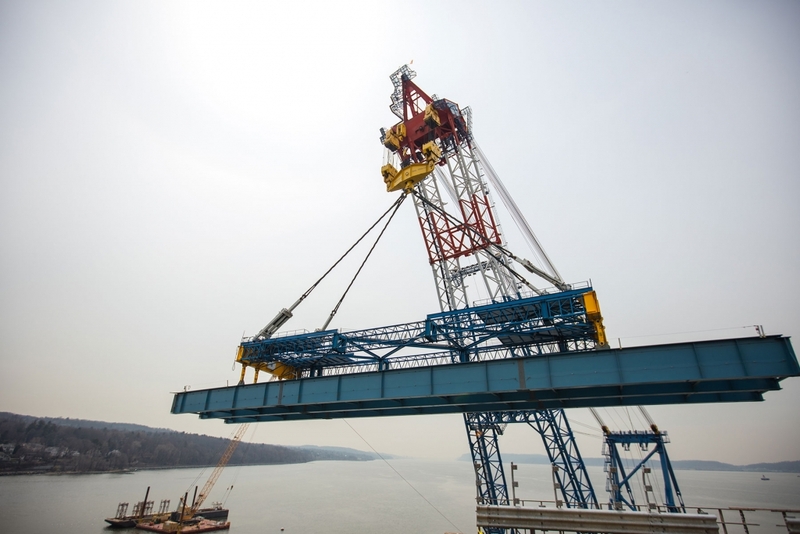 The placement of the final assemblies near the Westchester shoreline marked I Lift NY’s final construction activity. 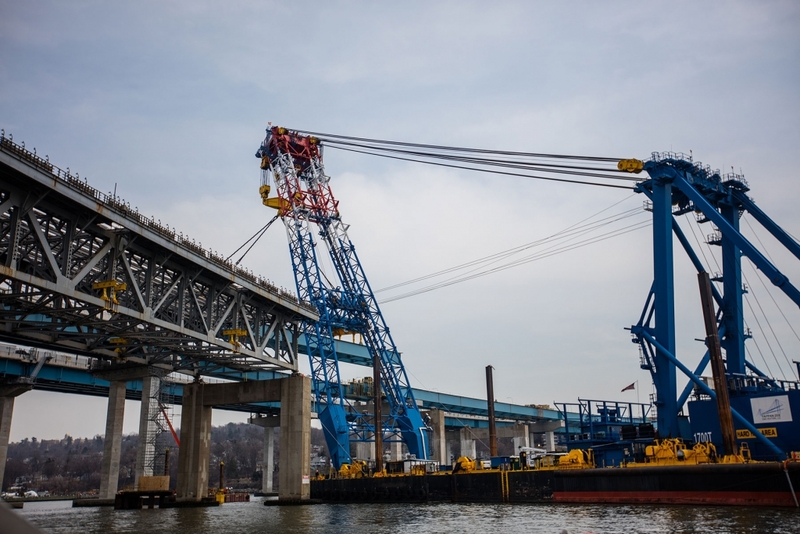 Throughout its three-year effort, I Lift NY has helped transform the project site from a scattered group of foundations into a connected, modern crossing. 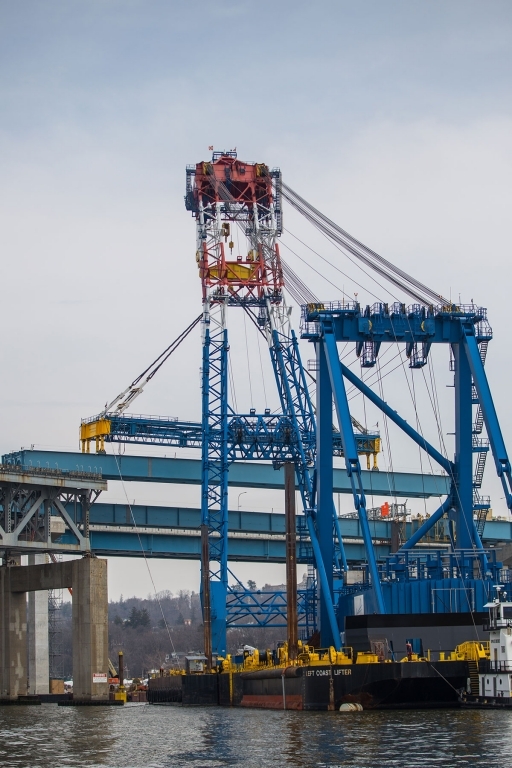 TZC used the floating crane to install thousands of tons of materials for the new twin-span bridge, including precast concrete pile caps, pier caps, giant crossbeams in between the main span towers and road deck panels. 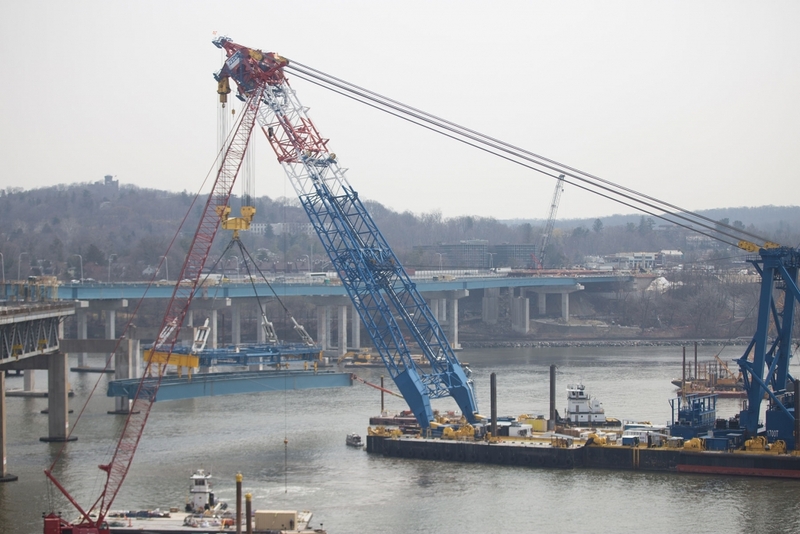 Crews will soon modify the crane to again assist with the dismantling of the old bridge. 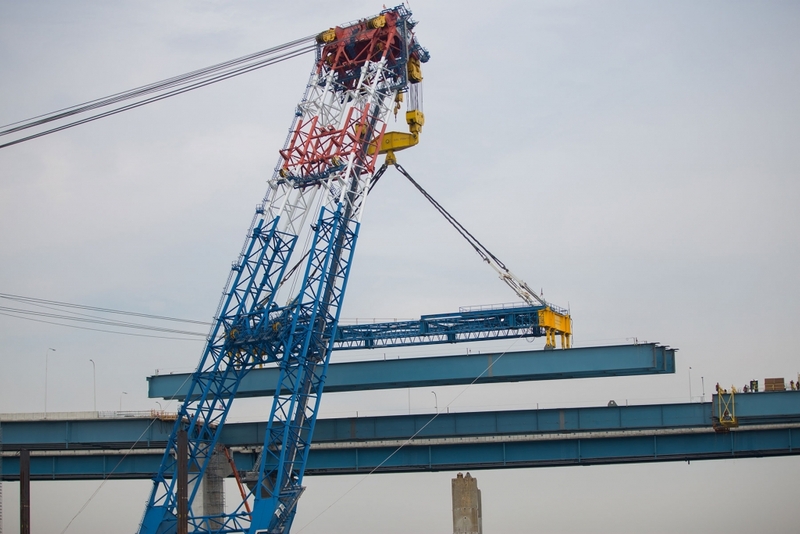 Since June 2015, the super crane, the project’s largest, has installed 140 similar assemblies of steel girders on the new approach spans, many weighing more than 700 tons. 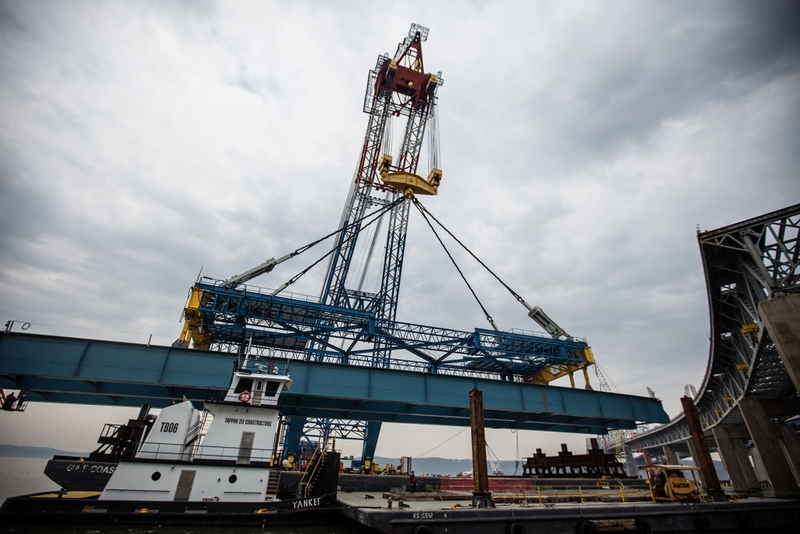 The machine’s 1,900-ton lifting capacity and custom-engineered lifting frame allowed the assemblies to be placed with precision. 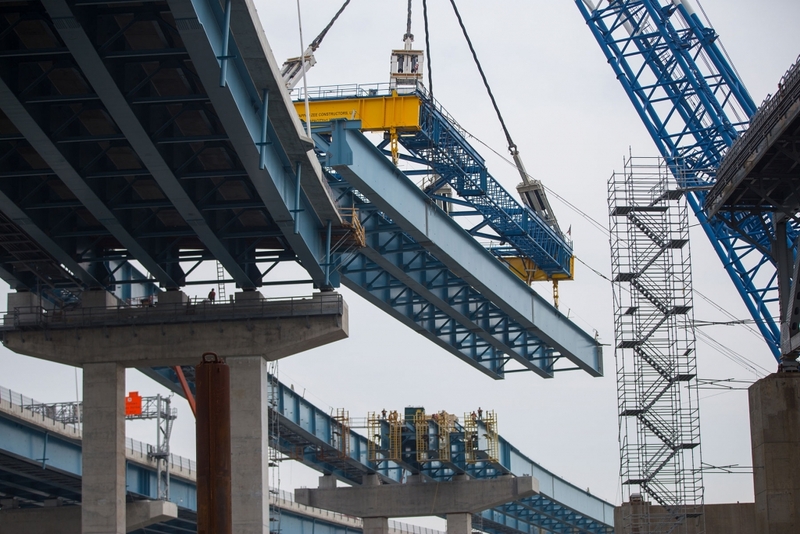 Each assembly began as an arrangement of individual steel girders, ranging from 60 to 120 feet. 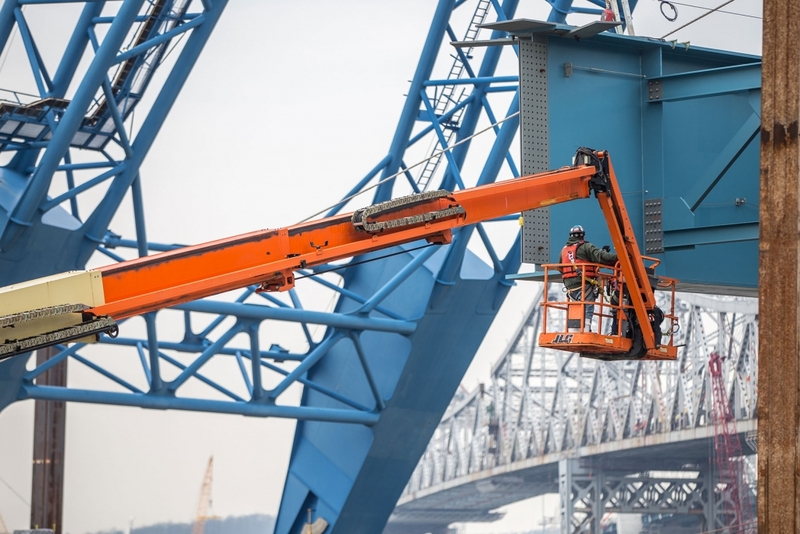 The girders were then combined with high-strength bolts, creating assemblies ranging in length from 290 to 410 feet. 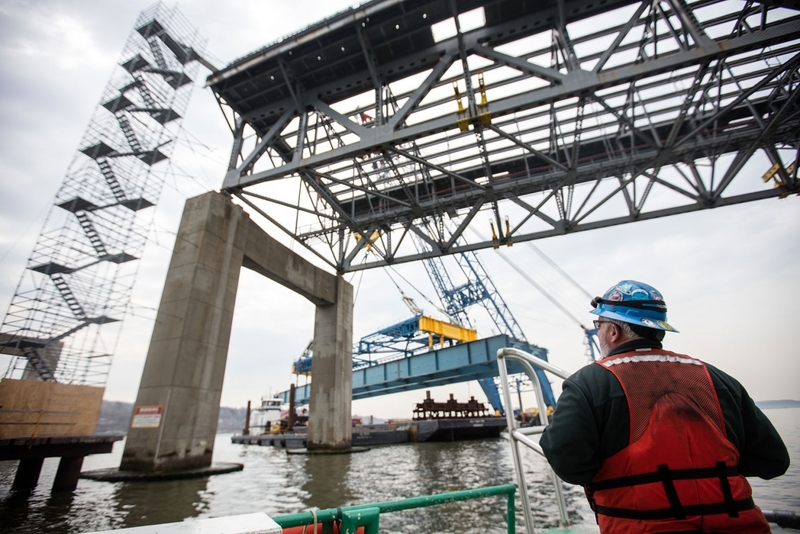 This modular construction method allowed TZC to accomplish a great amount of work in a controlled environment, reducing the amount of labor required over the Hudson River. 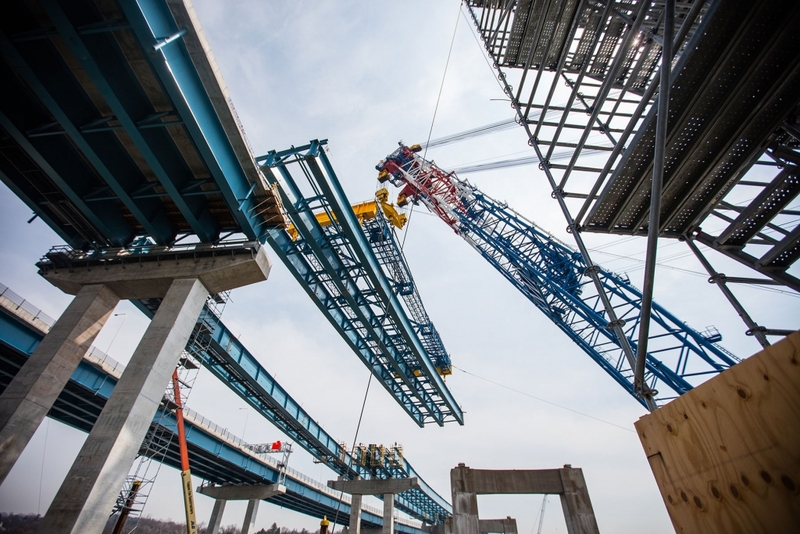 The steel girders rest atop the bridge’s concrete piers, and in turn support the road deck. If laid end-to-end, the girders would stretch for more than 30 miles, greater than the distance between South Nyack and the Statue of Liberty. 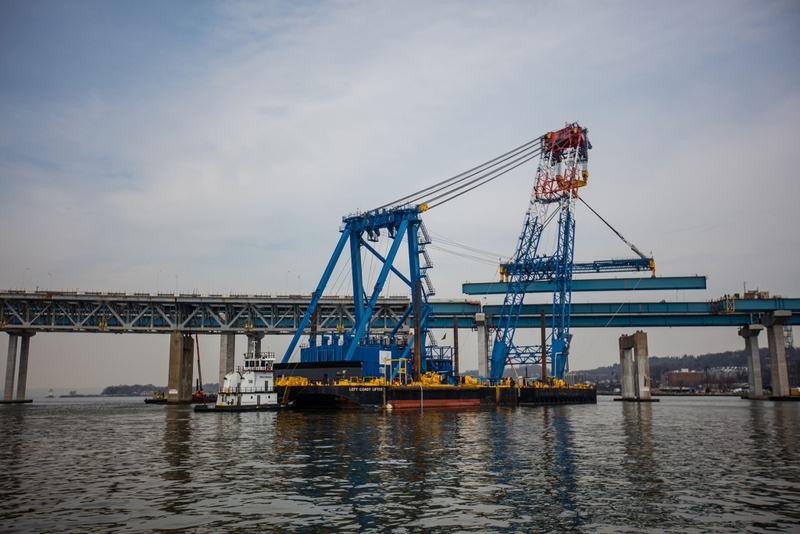 In addition to supporting the roadway, the assemblies include infrastructure to carry communications, electrical power, water and compressed air to support bridge operations. Subscribe to our monthly newsletter to receive these updates and the latest project information.